Philadelphia’s presentation of American watercolours is built around the careers of the Boston-born painter and illustrator, Winslow Homer (1836–1910), and the younger, European schooled, John Singer Sargent (1856–1925). It tells the story of the maturation of American art in the 19th and early 20th centuries, through an examination of the watercolour medium, whose trajectory was not dissimilar to that of American oil painting. 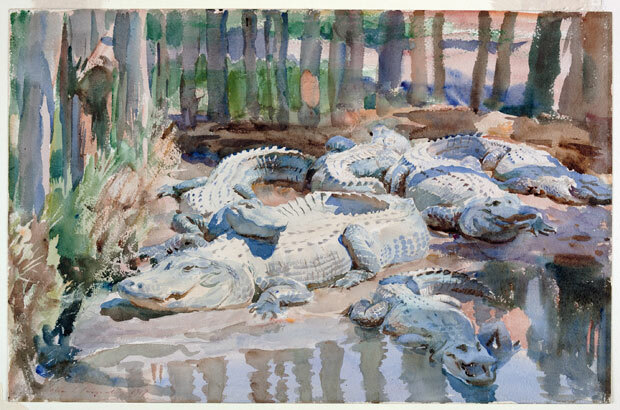 After years of sporadic forays into the medium, mostly imitative of foreign artists, Americans advanced watercolour beyond its traditional limits and dispensed with the need for ‘finish.’ Curator Kathleen Foster posits that over this period, watercolour emerged from the margins to become a star-making medium. 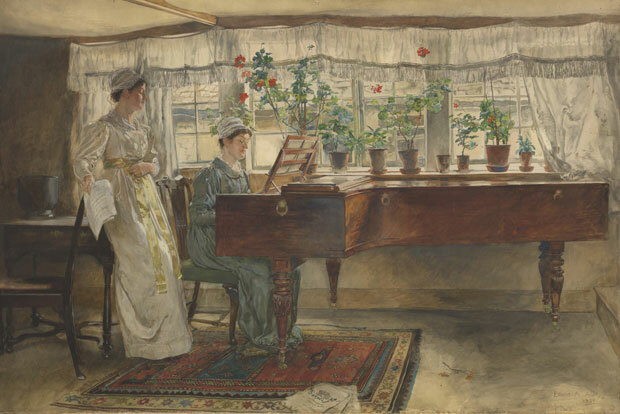 American watercolourists of the 19th century took their cue from the land of their forebears, inheriting British topographical and picturesque conventions. After mid-century they were informed by the teachings of John Ruskin to go out and make a close study of nature, and later they took to the bold romanticism of the late J. M. W. Turner. One hundred and fifty years ago, in 1866, a determined group of mostly landscape painters decided to form a society to promote this once disparaged medium. The American Watercolor Society was founded with Samuel Colman as the first president and James D. Smillie as treasurer. Unlike the National Academy of Design’s yearly shows, which were juried by a committee of peers, the society annuals were inclusive of amateurs, of women, and of marginal groups. Most striking of all, they were receptive to showing unfinished sketches. 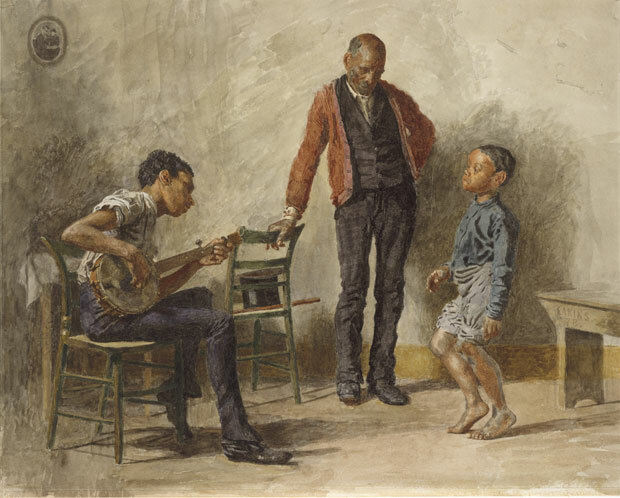 A breakout year was 1874 when artists like Thomas Eakins, Edwin Austin Abbey and Homer – whose reputations had been built on painting – participated for the first time. Soon the movement was the toast of the town, with a younger generation of American artists showing works reflective of their continental sojourns – to Spain (where Velasquez was a key influence), Italy (the likes of Fortuny), Holland (The Hague School) and Germany (Munich Realism). By 1876, writes Foster, the work of American artists, ‘[f]rom the stiff Pre-Raphaelite to the wildest freak of impressionism (not the French form), hung along side sparkling contemporary watercolors from Paris and Rome.’ As for Sargent (one of the most famous artists to feature in the show), watercolours had always served a private purpose, but just before the death of Homer he went public for the first time with a blow-out exhibition at the Carfax Gallery, London, in 1905. By the 1920s watercolor was seen as the ‘American’ medium. 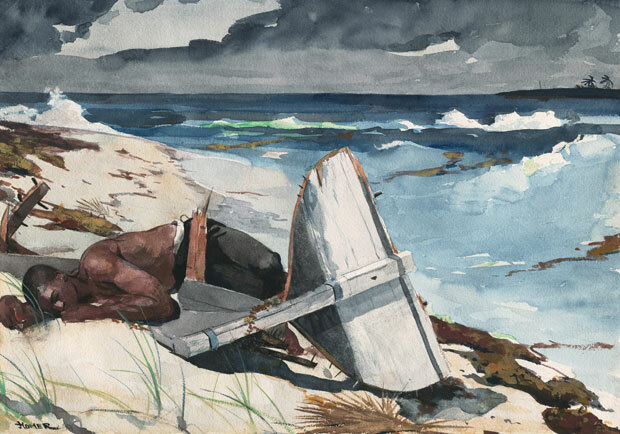 The legacy of Homer’s late works, which were notable for their audacious brushwork and saturated colors, was taken up by modernists like Charles Demuth, Edward Hopper and John Marin embraced the medium as a standalone form of expression.The critic Henry McBride boasted that Americans were ‘beating the world’ in watercolours, exploiting their tendency toward individuality and artistic expression. The exhibition closes with the death of Sargent and the rise of a new generation of stars. No longer for amateurs, American watercolour was, by this point, seen as an avant-garde – one of ambitious scale and bold expression. Among the highlights of the show is a deft selection of Homer and Sargent watercolours hung side by side, and an excellent video demonstrating how artists improvised with tools other than the brush, to mark and score the paper. This is a large show, bringing together over 170 works of art – many of them from the collection of the Philadelphia Museum of Art – and a display of artistic tools. Due to the fragility of the medium, such exhibitions do not occur with any frequency, and this one will not travel. ‘American Watercolor in the Age of Homer and Sargent’ is at the Philadelphia Museum of Art, Philadelphia, USA, until 14 May.